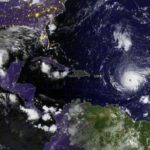 Rabbi Yaakov Zucker, director of Chabad of Key West, Florida prepares for hurricane Irma. File Photos. Two Florida Shluchim launched a lawsuit against the Federal Emergency Management Agency claiming religious discrimination after they were barred from receiving hurricane aid. One month later FEMA has reversed course and will allow religious institutions to apply for and receive federal aid for disaster recovery. In a policy reversal that comes one month after a federal lawsuit was filed by two Florida synagogues, the Federal Emergency Management Agency has changed its policy to allow religious organizations to apply for disaster aid grants in the wake of hurricanes Harvey and Irma. 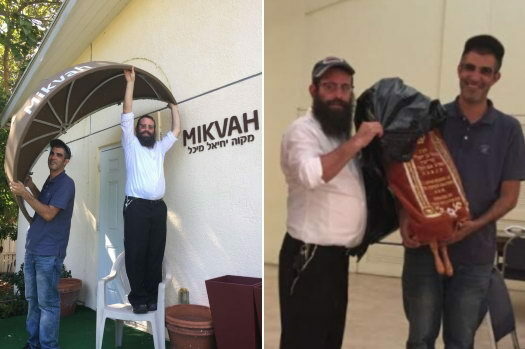 Chabad of Key West and Chabad of the Space Coast in Satellite Beach sued FEMA on Dec. 4 in U.S. District Court in Key West, calling unfair the former policy that shut them out of such aid. The lawsuit, though, will continue in federal court until the policy plays out for the synagogues, according to an attorney at the forefront of the case. FEMA has promised to treat the synagogues equally so it complies with the Constitution, Verm said. “As long as they’re complying, we don’t have a problem with it,” she said. FEMA announced last week that houses of worship no longer would be excluded from eligibility for FEMA aid. The assistance is limited to costs not covered by a U.S. Small Business Administration loan. Last year, three Texas churches severely damaged by Hurricane Harvey year sued FEMA over the policy, accusing the agency of religious discrimination. Irma, which struck the Keys on Sept. 10, left Chabad of Key West with roof damage and interior water damage that requires permanent repairs plus mold remediation, the lawsuit reads. Synagogues are in the same company as other private nonprofit societal institutions such as community centers and zoos, the lawsuit states. FEMA hasn’t yet responded to the lawsuit in court. So let me get this straight, Religious institutions want to be tax-exempt based off of the separation clause, but there’s a first to line up for a handout of tax money? Seems pretty greedy to me. Religious institutions are not exempt because of a non-existent “separation clause”. They’re exempt just like every other non-profit organization. And they’re entitled to the same aid that every other organization gets as a matter of course, without having to go to court. What they actually are saying is that they should not be excluded *because* they are a religious organization. These religious orgs. – any kind – are usually the first to help, well before FEMA or anyone else shows up. They dont deserve to be penalized for that. Which is exactly what this lawsuit was about – religious discrimination. And FEMA agreed and amended their rules. No religious organizations should be receiving any federal aid. They are already tax exempted–what more do they want? Apparently tax dollars LOL! They want it both ways–government stays out of their business but they reserve the right to hold out their hand for government funds when disaster strikes. No way José! All non-profit organizations are exempt from tax. Religious ones are just as entitled to aid as secular ones. Denying them the same aid everyone else gets, just because they’re religious, is outright unconstitutional, and it’s a disgrace that FEMA used to engage in such blatant discrimination until forced to change its ways.